Eve Mosher originally created the HighWaterLine project to help New Yorkers visualize how climate change will impact their city. 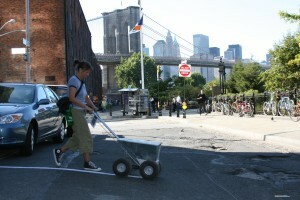 In 2007, Eve chalked 70 miles of Manhattan and Brooklyn that would be severely impacted by increased mega floods if climate change continued. Prophetically, the very area Eve demarcated in 2007 was flooded in 2012 by the climate change fueled superstorm Sandy. Sandy awoke many people to the power of using HighWaterLine – a public interactive art project – as a tool to help communities visualize the future and organize to develop solutions. In 2012, Heidi Quante, a climate change organizer and creative communication strategist, approached Eve about developing HighWaterLine into an innovative tool to help communities develop local resiliency to climate change. Heidi brings with her 14 years of working on environmental issues and a passion for designing innovative ways to develop community based resiliency. In 2013, Heidi moved to Miami to collaborate with the local community to successfully realize HighWaterLine in Miami, the most climate vulnerable U.S. city. 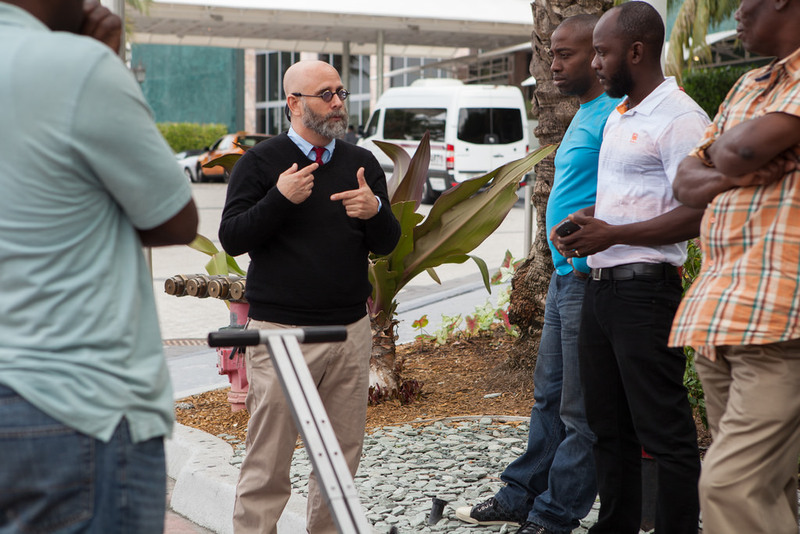 Over the course of four months, HighWaterLine | Miami brought together communities from the City of Miami and Miami Beach to participate in a series of workshops to devise local climate change resiliency. In November of 2013 members of the community demarcated 26 miles of the city that will be underwater due to future sea level rise or if an extreme storm hits, (Miami lies in a hurricane landfall zone.) The public art intervention allowed communities to visualize the future impacts of climate change before they hit as well as inspire conversations about this urgent issue not widely discussed publicly.At the end of the project, participants shared how participating in the project – from storytelling to conducting a public art intervention – was truly transformative and provided a much need “creative new space” to devise innovative ideas for tackling Miami’s pressing problems. HighWaterLine | Miami inspired a new community based movement, Resilient Miami, that is now building resiliency to climate change at the local level. This positive response from the Miami community inspired Eve and Heidi to collaborate with communities in Philadelphia, Boston and in England to realize HighWaterLine projects in these communities as well as write a community guide (to be completed September 2014) for other communities globally who want to realize HighWaterLine in their respective regions. The enthusiasm and support Eve and Heidi received from participants and colleagues for using creativity as a tool to empower communities living on the frontlines of climate change has made them appreciate the massive need for an innovative approach to environmental problem solving. Eve and Heidi are passionate about working with diverse communities to personalize global issues like climate change by facilitating processes whereby the general public is empowered to tell their story and become a key part of writing the solution. They are eager to help other communities realize HighWaterLine in their respective communities and if flooding or sea level rise is not the primary challenge, collaborate with communities to design a creative public art intervention tailored to their community challenge.